2017 marks the 100 year anniversary of Kerseys’ founder’s son’s death, who was killed at Passchendaele during World War 1. Kerseys Solicitors was established in Ipswich 1881 by a then 21-year-old William Edward Kersey. His only son, William Henry Myddelton Kersey (known as ‘Myddelton’), who was expected to join his father’s firm, was killed in the infamous western Belgium battle at the age of 24 on October 17, 1917. Managing and senior partner Anthony Wooding said: “It’s sad, but also important to be reminded of our long history. It helps us to put our difficulties into perspective and recognise the opportunities many of us have today. Myddelton was killed near Ypres when a stray shell fell on his unit’s dug-out in the early hours of the morning, while they were sleeping. 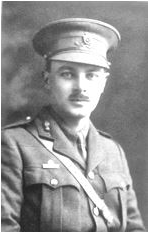 According to research by Magdalen College, Oxford University, where he studied, a brother-officer, Captain Leonard Amis Hempson said the men would have moved from their doomed position the night before – only for a hitch in arrangements. Hempson ended: “But for a hitch in the arrangements, the Battery would have been out of the position before last night. It was to be, I suppose, and we can only accept it”. Myddelton is buried at The Huts Cemetery near Ypres in Flanders, Belgium. A battlefield cross was given to the family in lieu of his body, which has been placed at St John the Baptist Church in Felixstowe in his memory. He left behind his father, William, mother Ada Laura Kersey (nee Peggy) and one sister, Marion Elizabeth.